We know you're busy with life and work. Your wedding should be fun to plan, not something you dread. We love DIY weddings, so long as the amount of doing it yourself is manageable. Many of our brides and grooms want to make the choices themselves, but not actually pull it off on the big day. Everyone needs someone to help on their wedding day. Even professional event planners hire someone to help make sure it all runs according to schedule, ensure the vendors show up and follow the agreements, and act as an extra set of hands (and feet) to get things when needed. CW Ranch offers planning for our brides and grooms, so you can be sure you're getting the most from your budget. You'll also have confidence from the get-go that you're making good choices with who's providing you services for your wedding day. We recommend having someone coordinate the big day when it comes. You should be a guest at your own wedding. And so should your sister. And mother. And best friend. Hand the plan to us, and we'll make sure it's all taken care of for you. Every bride wants her wedding to look pretty, and beautiful flowers are like jewels adorning the venue to make it shine. We know floral is a personal touch you add to make the wedding your own. We love to take your style and vision, then create arrangements to bring the inspiration to life. 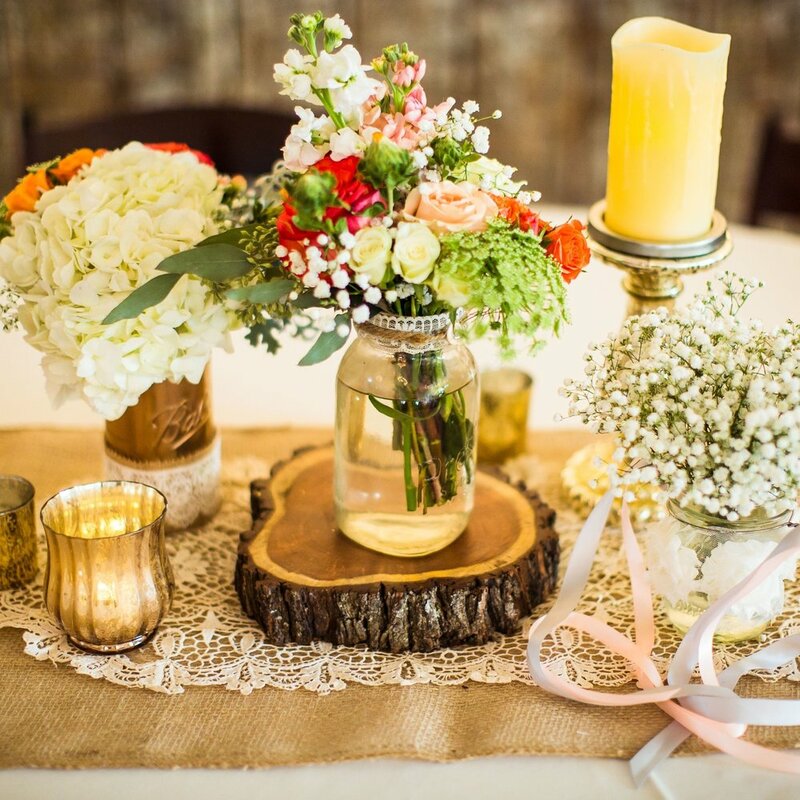 Designing bouquets, centerpieces, and accent arrangements is also one of our passions. You'll see we take great pride in contributing to the feel of the décor throughout the ceremony and reception. We know the spaces at our venue better than anyone, and when you work with us to layout the room we'll share our expertise and aesthetic to match what you have in mind. We hope you enjoy our traditional, simple floral aesthetic in many of the photos in the images throughout our galleries. We've partnered with a professional bartending service to provide our brides, grooms, and guests with impeccable service and tasty, original cocktails. If there's one things we've learned in our years of hosting weddings, it's to not mess around when it comes to people's beverage experience. If you've ever tried to make drinks for 150 people you know how hard it is to make sure everyone's taken care of without a long wait. We make sure that your guests see you as a gracious host by not making them stand around waiting for a drink. Packages come with all the fixin's you'll need, including cups, ice, mixers, specialty drinks, and premium flights for the more refined palettes. If you want it and we can source it, we'll pour it at your wedding. All packages come with choices of signature cocktails, so you can put your mark on the celebration in style.